A trip to a local lake is a common summertime activity for many. But there’s nothing typical about where Yarrow Axford has been boating for the better part of a decade. An associate professor of earth and planetary sciences at Northwestern University, Yarrow has repeatedly traveled to Greenland since 2009 to collect climate clues from lakes that sit around the margins of its massive ice sheet. She believes the lake data can complement the climate record that others have established from a handful of ice cores drilled into the ice sheet dating back to the 1950s. “My long-term goal in Greenland is to work my way around the margin of the Greenland ice sheet and quantify past climate warming and climate cooling that affected the ice sheet, to get that big-picture perspective from around Greenland,” Yarrow explains. Understanding how the Greenland ice sheet, as thick as three kilometers in places, reacted to past climate change will help scientist better predict future sea-level rise. The ice sheet that blankets most of Greenland, an island about a quarter the size of the continental United States, could cause sea level to rise by more than six meters, or about 20 feet, if it all melted away. Yarrow and colleagues from Northwestern and Dartmouth College just published results from fieldwork involving lakes in northern Greenland that found summertime temperatures during two distinct time periods in the past were far warmer than today. Due to natural changes in Earth’s orbit, part of the early Holocene—the current geological epoch that began about 12,000 years ago, coinciding with the rise of human civilizations—was about 4 to 7 degrees Celsius warmer than present. During the last interglacial, an interlude between so-called ice ages that occurred about 130,000 years ago, temperatures peaked at about 5.5 to 8.5 degrees Celsius higher than today. The findings were published in the prestigious journal Proceedings of the National Academy of Sciences. Northwestern PhD student Jamie McFarlin is lead author on the paper. The results, based partly on analyses of sediment samples containing fossil insects and plant pollen, are significant for a couple of reasons. First, they help explain the rapid melting of the Greenland ice sheet in the early Holocene. Second, they confirm similar temperature records gleaned from ice cores for the last interglacial, known as the Eemian, despite other evidence that suggests the Greenland ice sheet contributed less to sea-level rise than would be expected based on the higher temperatures. The National Science Foundation’s Office of Polar Programs supported the research, which was part of a larger collaboration with glaciologist Erich Osterberg and glacial geologist Meredith Kelly of Dartmouth College. “I think one thing that has been surprising to me is the magnitude of past climate change in the northern part of Greenland,” Yarrow says, particularly around the northern margins and Ellesmere Island off of Greenland’s northwest coast. She says the warming is likely greater than researchers originally believed, and that should allow climate scientists to further hone models that are used to predict future changes in the ice sheet. Driven by changes in Earth’s orbit over the last one million years, Earth’s climate has fluctuated between 100,000-year-long glacial periods and warmer, interglacial periods that last about 10,000 to 15,000 years. While the current interglacial period, the Holocene, is part of that natural climate cycle, nearly all climate scientists believe human activities, especially the burning of fossil fuels, are causing an unnatural rise in global temperatures. That not only affects polar ice sheets but disrupts entire ecosystems, with wholesale extinction of species already under way. Yarrow and her students are not done yet. The team is in the midst of a new five-year project, supported by an NSF CAREER award from the Office of Polar Programs, to reconstruct the early Holocene climate record from a string of lakes along the southern margin of the Greenland ice sheet, in a much different climate zone than northern Greenland and where such data are extremely sparse. The scientists plan to head back to Greenland this summer for the second of three planned field seasons. They aim to visit remote lakes in southernmost Greenland, ranging in depths from about eight to 80 meters, to collect sediment cores from the muddy bottoms of the lakes. The researchers work aboard inflatable boats called Zodiacs that are compactable enough to be transported by helicopter. “Some of them are designed to even be back-packable, so some of these systems are very small,” Yarrow notes. The most high-tech piece of field equipment is a new addition for this year, what Yarrow calls a “fancy fish finder.” The acoustic sub-bottom profiling instrument bounces quiet sound waves off the lake bottom to provide a view of the lake stratigraphy—similar to how seismographs can image the earth’s crust—helping guide where the team will collect its sediment cores. Analysis of the samples back in the lab is decidedly more high tech. Perhaps one of the most interesting tools relies on insects. A family of lake-loving midges, or biteless flies, called Chironomidae are particularly sensitive to changes in temperature. Scientists have constructed a sort of midge thermometer, using more than 200 species, that matches a particular midge species with specific lake conditions including temperature and acidity. 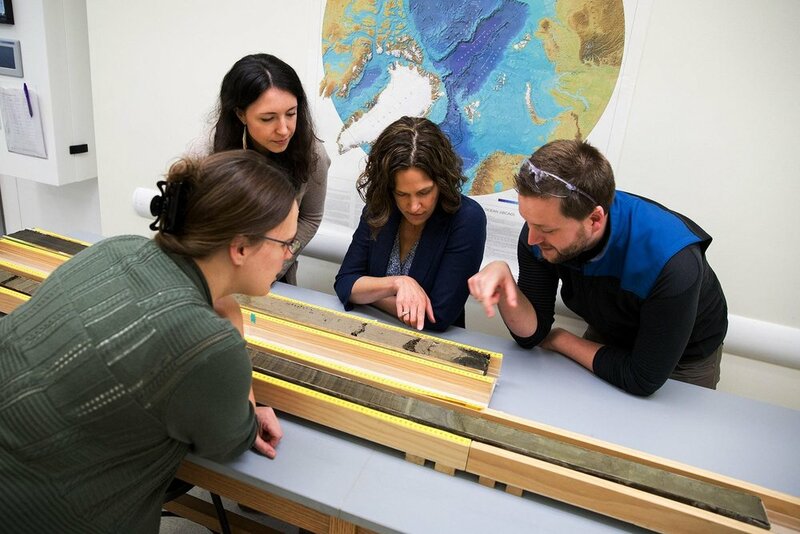 Left: Researchers examine sediment cores in Axford’s lab at Northwestern. Photo by Eileen Molony. Right: Chironomid remains extracted from a sediment core. Photo by Yarrow Axford. The larval remains of the chironomids, as well as plant material in the sediments, also help with geochemical analyses that analyze isotopic composition of lake water. Different isotopes of oxygen and hydrogen, the two elements that make up water, can provide details about past water temperature, evaporation, and even atmospheric circulation. The hydrogen isotopes come from plant materials while the oxygen isotopes are “pulled” from the bugs, as Yarrow explains: “So the remains that we are pulling out for species identification are organisms that lived in the lake water, and they get their oxygen from the lake water, so we’re using those remains physically picked out of the mud to get at oxygen isotopes.” Northwestern students are also analyzing hydrogen isotopes in plant materials, in collaboration with Northwestern geobiologist Maggie Osburn. The team is also interested in getting at how mountain glaciers in the south, separate from the kind of glaciers that directly drain the ice sheet, changed over time. Those details can be teased out of the composition of the mud itself, predominantly by looking at the stratigraphy of the sediments. “We’re trying to understand how the degree of glacial influence on a lake waxes and wanes over time from looking at the character of the mud,” Yarrow says. In simplest terms, the presence of brown mud means there wasn’t a glacier upstream, while grey mud denotes a mountain glacier was actively influencing the lake. The ebb and flow of glaciers is another climate proxy for building that “big-picture perspective” from around Greenland. Of course, the story of climate change in southern Greenland will not be that brown or grey. In fact, the data are so sparse that Yarrow can only hypothesize at this point that the gradient of climate change will lessen from north to south. “I think we’re starting to see that there is real variation across Greenland in the way that climate change has manifested in the past,” she says. “I suspect, based on the data that we have so far, that at higher latitudes we have bigger climate changes. At the same time, we have relatively smaller changes at southern latitudes, but I can’t really say that with confidence. It’s a hypothesis right now.